I am in the process of generating several larger paintings for gallery shows. This is the first one. It is rather an abstract one. I was trying to create a flow of light and color. It is always fun painting flowers. After you have managed the anatomy of the flowers, you will feel much of freedom and creativity. Let's put all the hard times of 2009 behind us. Let this cascade of beauty make your New Year more exciting. 2010 is coming. I wish all of you good luck. Thank all of you for being with me and supporting me. This one took me three days to paint. I feel happy that the painting does not show much of over work. This year went by so fast. Now we are at the end of it. 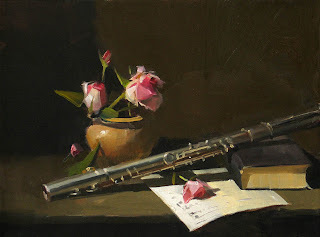 As a painter, I feel very lucky, because painting helped me "freeze" the time. Every painting I did is a milestone. It reminds me what I was thinking at the moment I was creating that image. When we are getting old, our physical memory does not work as well as we were young. We hardly remember what we did yesterday. However, if you are a painter, you can archive your life so vividly. I am really blessed. Darkness is full of mystery. We often feel insecure in it. However, the darkness implies potential. We have more room to grow. I put the background of this painting is completely darkness. It gives the vastest contrast for the center of focus to stand out. By the way, I didn't use any blacks. The background was done with Phthalo blue and Alizarin Crimson. 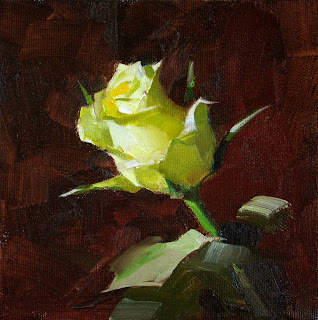 The painting is so typical of David Leffel's style. I am learning how to paint space. Although the size of the painting is only 8" x 10", do you feel the painting is quite large? I really like this one. I think I got what Sherrie and David told me finally. Now is the morning of the Christmas day. I haven't unwrapped my presents yet, but I have felt blessed already, because I have got the most precious gift --- TIME today. This is my first time posting a painting so early in the morning. Please accept it as my present to you all. I wish all of you have a Merry Christmas and Happy New Year. Thanks to all of you for your constant support. Now I will go to our small Christmas tree, and I will have a lot of fun with my family today. I should have been painting in my evening hours, but I didn’t get chance to do that lately. Instead, I have been learning QuickBooks and trying to get some bookkeeping going. Nowadays, people like me don’t have the luxury to concentrate on the art development. We have to take care of everything. Too bad we have only 24 hours and I spend the best part of it onto the boring stuff to make a living (a very interesting phase). The art projects always are the first bunch falling into cracks. Life is hard, and more and more complicated, but I am still optimistic. I can’t develop my art at the pace I wanted it to be, but it is at least progressing day by day. I felt the year went by so fast, and the holiday season is here again. I am satisfied. I have achieved a lot in my art with the meager time and energy I have. 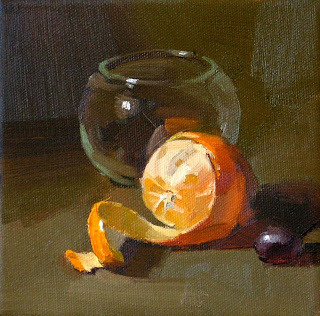 In my today’s painting, I am still experimenting with what I learned from Sherrie. I will let the future decide weather or not I would keep this approach. The painting is a little larger (8” x 8”) and I put greens and reds on my setup. I hope our regular days will be as merry as Christmas. Happy holidays. I did this painting for a friend. I am not going to talk too much today. Please enjoy. After my previous post, I received many comments, and most of people disagreed with me this time. How big the object is too big is a very subjective matter. 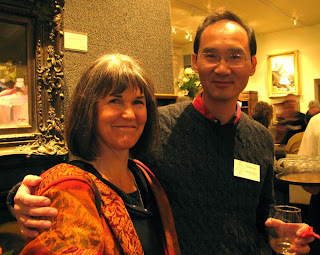 Since I was attending Sherrie’s (and David’s) workshop, I did not want to do what I usually do. I really want to sense their way of judgment. 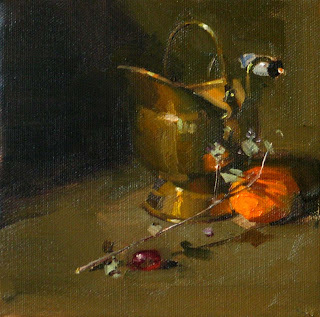 Painting objects relatively small is part of the secrecy of the David Leffel style. David is painting the void. 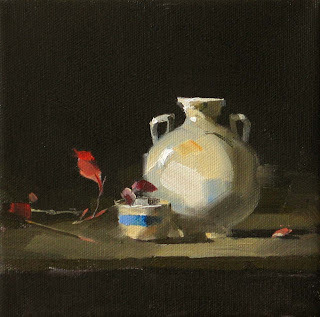 Using the subtle and smooth background and less occupied foreground, he sets up the boundary of the void to generate the effect of spaciousness. That is why David’s and Sherrie’s paintings have impacted us so strongly. So I don’t mind to create similar effect on my painting as well. Now, since we are talking about learning from the masters, I want to share some my experiences. At the class, I hardly taking any notes, but I pay a real attention to their demos. The masters communicate with you using visual language. So you need to listen with your eyes instead of your ears. The verbal part of their teaching is quite secondary to me. I hardly remember any their words. However, if you get a good result or some light bulbs start to blinking, make sure you document it verbally so you can remember better and organize the good effects into your own system. Moreover, if I may say some words to our beloved master artists who teach as well, I will say: Teaching is very left-brain process. To help the students to grow and also not mislead them, the teacher needs to do massive amount of work to translate the visual language into a verbal one, and present it in a systematic way. If there is a short of vocabulary, please create some. I heard Eskimos could identify many more kinds of snows than most of us. We artists should be able to describe many different kinds of grays verbally and pass them on to our students. We have an orange tree in the front yard. My son, Jonathan, picked one with leaves on it. 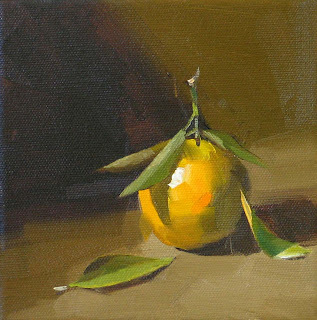 I did many orange paintings, but I really like this one because the leaves provide more shape variation. After I talked in my blog about studying with Sherrie McGraw. I received quite a few emails and comments asking about what I really learned from her. Very simple, she said I painted my objects too big. This painting is good start for improvement. I made the orange relatively small and gave more space to the background, so the painting appears larger. 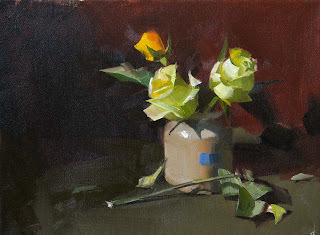 When Sherrie mentioned that I painted my objects too big, I suddenly realized that David Leffel told me the same thing. Many years ago I took workshop with David. I was concentrated in painting and suddenly I heard several Chinese words: "Qiang Tai Da"(meaning: Qiang, it is too big). It was David. He knows quite many Chinese words. This time Sherrie pointed out same problem again. I realized that a problem can be so persistent. It is amazing that it takes so many years for me to understand a simple instruction like "too big", even it was in my native language. At Sherrie's workshop, I only did two paintings. the one I posted previously took me relatively shorter time. However, this one took me almost two days. Remember I was talking about learning from her how to create drama. This one is my experiment. The setup was done completely by Sherrie. When I started to paint, I felt I was powerlessly disarmed. You know I like to use high chroma colors, high contrast value range, and expressive bush works. I had none of those with this project. The color and value of the pot is almost the same as those of the background. The shapes of the arrangement were complicated and irregular. The roses were dying (they withered and died completely on the second day). I almost ran away from it. Well, I am glad I did not. I suffered through. And I started to appreciate the subtlety of the setup. It gives more potential for me to express, and the painting quality will be elevated to the next level. It is so great to see the opportunities. Did I show more "drama" in this one? 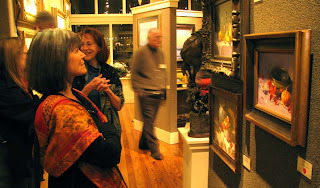 Last Saturday night, the InSight Gallery has its Celebration Show. I had a great time there, enjoying wonderful images, chatting with old friends and meeting new friends. 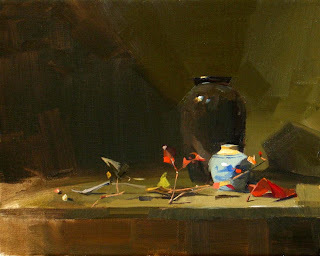 The high-light for me was that I had Sherrie McGraw looked at my gallery level paintings and listening her critiques. Her comment was enlightening. I started to realize some common issues in my art. She really showed me a new path for improving my work. I think the significance of taking workshops from masters is not mimicking their approaches, but getting your mind in tune with the teacher. Otherwise you would not able to understand what the teacher talking about even you know all the words. Hello World! I am back. It has been a wonderful break. Now I am recharged and ready to work again. As a matter of fact, I have resumed my busy life several days ago. Three days ago. 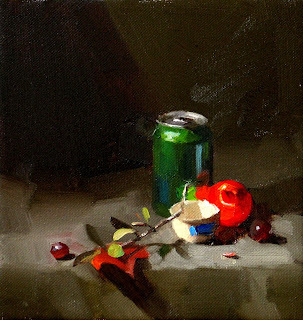 I went to Fredericksburg, TX again attending a workshop by one of my most admired master artists: Sherrie McGraw. 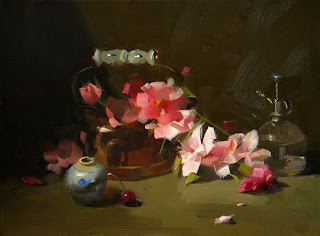 Without seeing her and David Leffel's masterpieces of still life paintings, I can't imagine I paint still life today. I am so excited that I can study with Sherrie again. My posting for today is one of paintings I did at her workshop. Can you see some of Sherrie's influence in it? 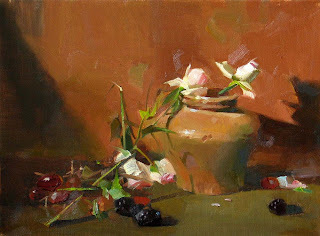 I have a well defined intention when I attended her workshop: I want to know how she sets up and creates such a dramatic effect in her paintings. Here is what I have learned (I think): CONTRAST. Please contemplate on this word, your painting will be improved dramatically. Coincidentally, This Sherrie's workshop has been documented by American Artist's Workshop Magazine. I don't know exactly when the article will be out, but you will see it in the near future.